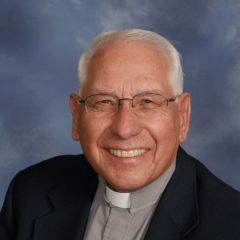 Ken Carlson began his ministry in 1967 and served as a pastor, Mission and Ministry Facilitator and Circuit Counselor/Visitor in the Southeastern District until his retirement in 2008. Ken currently serves St. Andrew as pastoral visitor to the sick and shut-in, and occasionally teaches, preaches and presides over worship. Ken and his wife Carolyn live in North Potomac. They have four grown children and seven grandchildren.